KHL.ru goes on with teams’ review. Today it’s Spartak’s turn. The Red-Whites led by Vadim Yepanchintsev managed to fulfill the season’s main goal and after a five-year pause they managed to get to the playoffs. However, Spartak’s postseason was very short. On March 20, 2017, changes in Spartak’s hockey operations staff were announced, even if it looked like all started significantly earlier. It was clear that Alexei Yarushkin was only a temporary head coach, hired with the “performing duties” label, and that he would not last long. There were many rumors about many different coaches, and the choice fallen on Vadim Yepanchintsev, a player who started making a name for himself playing for Spartak in the 90s. During the season, it was clear that the choice was a good one. During the offseason, the Red-Whites didn’t lose many big names, pretty much the only one was Matt Gilroy who, playing as a defenseman, was the top scorer of the team with 38 (7+31) points. The American blueliner moved to Jokerit, while from the Finnish team, Spartak signed Ville Lajunen. But Spartak’s main move happened in mid-August, just before the start of the regular season. SKA sent to Moscow Alexander Khokhlachyov – who already played for Spartak – receiving the rights on defenseman Yaroslav Dyblenko. Moreover, the team retained Ryan Stoa and Lukas Radil, while on the crease was expected a seemingly even competition between Nikita Bespalov and Markus Svensson, but then the Russian goalie outplayed his Swedish colleague, who stopped getting to the lineup. It is possible to split Spartak’s regular season into three parts. In the first, the Red-Whites were not successful. At the start, the team alternated wins and losses, but remained within the eighth place in the Western Conference standings, on the edge of the playoffs zone. At the end of September, Spartak managed to have three wins in a row, with, amongst them, a win in an incredible game against Admiral, finished with a 7:6 score in overtime, when the Red-Whites managed to send the game to OT at just two seconds to the final horn. However, in the first half of October, the team had a decline with six defeats in seven games, gaining only two points and falling to the 24th place in the general standings. After this series, the team’s general manager Alexei Zhamnov decided to get to the bench himself and it had a very positive outcome. Spartak had a great period with 11 wins in 12 games. Only Dinamo Minsk managed to defeat the Red-Whites, with a SO win. Even SKA had to fall to Spartak. Unfortunately for their fans, the Red-Whites failed to repeat such a streak. However, the team slowly climbed the standings and the chances to get to the playoffs improved. On December 9, the team organized the traditional “retro game” and Slovan was defeated with a huge 8:2 score. Close the end of the year, Spartak had a successful tour in the Russian Far East and China, defeating Kunlun and Admiral. On January 18, the Red-Whites defeated HC Dynamo in the Moscow derby, even if they risked a lot when they were up 5:2 and closing the game with a 5:4 score. Alexander Khokhlachyov scored a hat-trick. The team hoped to fulfill its goals before the Olympics Games pause, but a loss to Severstal had its impact. However, Spartak only needed one point in the last two games of the regular season to get to the postseasons, therefore the team was quite calm. 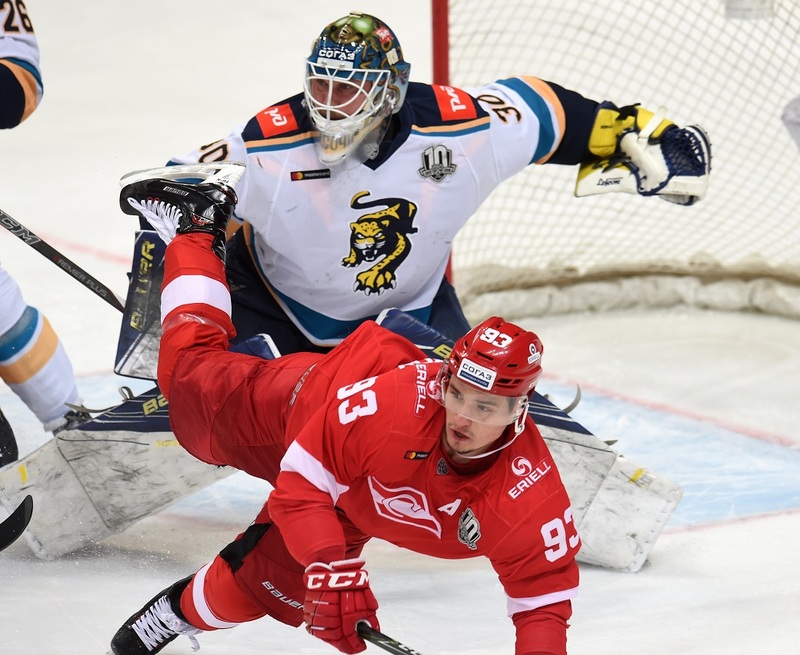 After the Olympics, the Red-Whites lost their first game against Lokomotiv (0:2), therefore the very last regular season game, another derby against HC Dynamo, would decide everything. During the game, Spartak was down (1:2), but in the third period the Red-Whites managed to reverse the momentum around and, thanks to the 4:3 win, they went to the playoffs. The team didn’t manage to be as effective in the playoffs. The eventual Gagarin Cup runner-up outplayed the opponents in any game’s component. The situation was clear in the first game already, when CSKA won 6:0. Spartak scored their first goal of the series only at the 58th minute of the third game when CSKA was up 3:0. That goal was the only goal scored by Spartak in the postseason. On March 8, CSKA won (1:0) with a goal by Matt Robinson and sent Spartak on vacations. 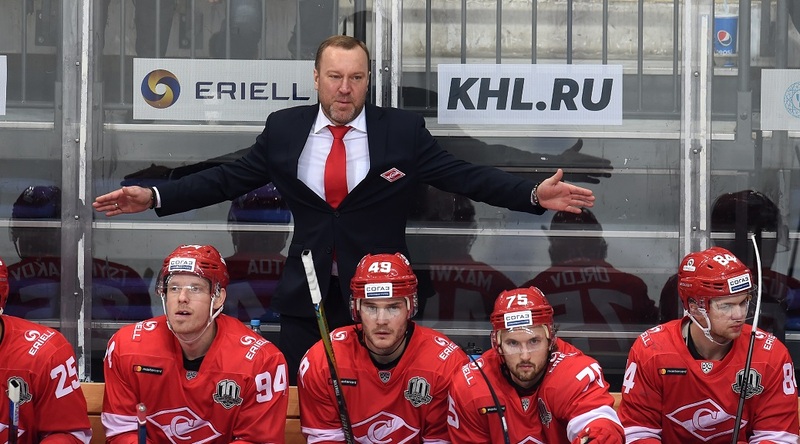 For Vadim Yepanchintsev, 2017/2018 was his debut season as a head coach in the KHL, even if he had a good deal of experience earlier, as he worked both in the MHL (Atlanty) and in the VHL (Saryarka). This year’s Spartak had some players who started playing pro hockey in the MHL with Spartak under Yepanchintsev, and this was one of the reasons why the club decided to hire him. The season hasn’t been easy, however the staff managed to turn things around and get out of the crisis. The boards had to take some hard decisions and strengthen the roster during the season. The team managed to get to the playoffs and please the fans after a five-year hiatus. However, probably the fans weren’t too happy with the results in the playoffs against Moscow rivals CSKA. Even the postseason fiasco, however, did not outweigh the simple fact that Spartak got to the playoffs. 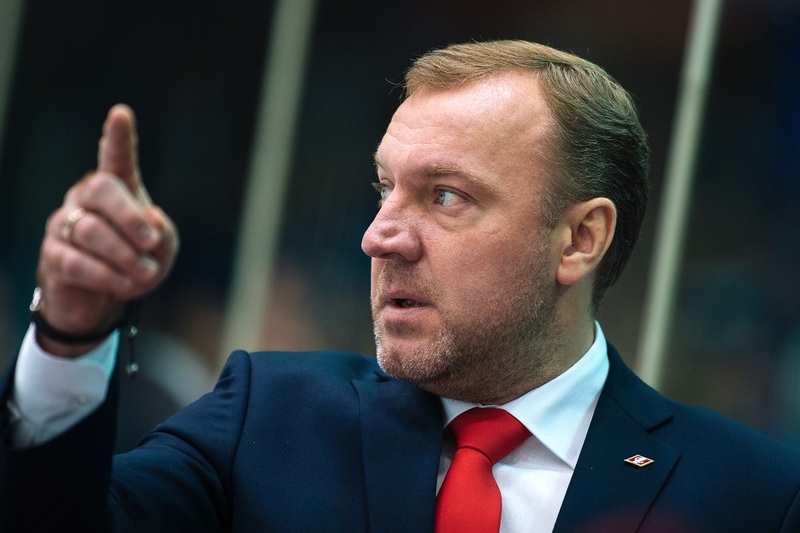 After the series against CSKA, once again the media started spreading different rumors about the new Spartak head coach, however the boards decided to give Yepanchintsev another season. However, he will have new assistants. Andrei Potaichuk and Viktor Kostyuchyonok will be replaced by Dmitri Gogolev and Igor Ulanov. 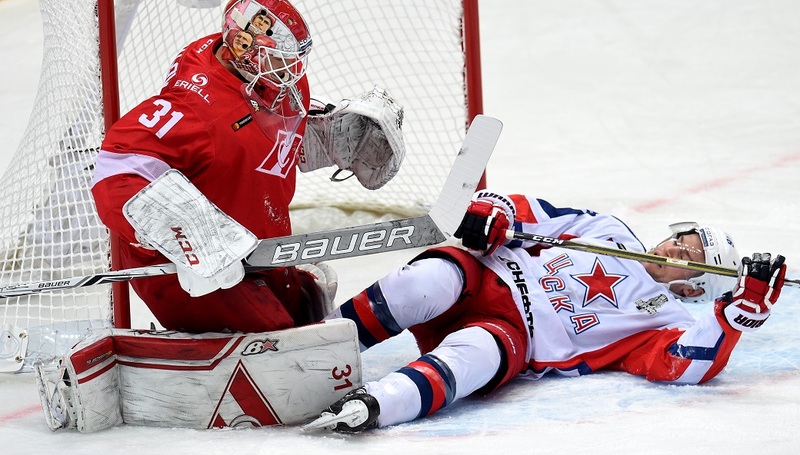 Spartak got to the November 2 game with a bad stat in the games against SKA. On September 4 and October 4, the St. Petersburg team defeated the Red-Whites both times (5:0 and 4:0, respectively). Until then, SKA didn’t lose a single game in regulation, had a six-game winning streak and played in their packed home arena. Even though Spartak gained some momentum, their chances were seen as minimal. However, the Red-White found some players who knew how to deal with SKA. The two Alexanders, Khokhlachyov and Dergachyov, both former SKA players, decided the outcome of the game. The first opened the score, and the latter scored the game-winning goal. At the start of December, Spartak was in a solid playoffs spot, and the team was expecting to gain three points in the game against Vityaz. The Moscow Region team was in a good streak with four wins in the last five games, but they were quite far from the playoffs positions. What happened at the VTB-Arena was truly surprising. 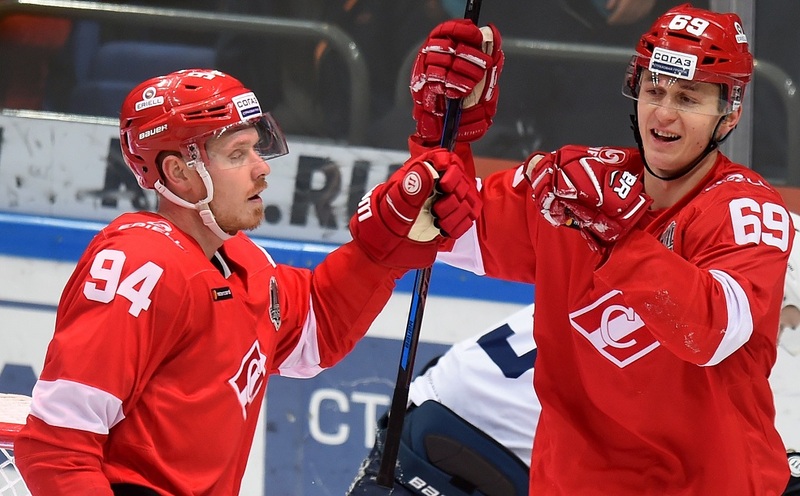 Dmitry Semin scored the go-ahead goal for Vityaz after an error by the Spartak defense – and a significant on-ice advantage for the Red-Whites – but it looked like a lucky start. However, the second period was a nightmare for the home team and the final result was a sound 2:6. Last year was definitely Alexander Khokhlachyov’s season. He started making a name for himself playing in Spartak’s junior team in the MHL, then moved overseas, got back again to Spartak and had another voyage in North America. The second trip was more successful, as Khokhlachyov had great stats in the AHL, but in Boston he played only nine games in three seasons. For the 2016/2017 season, Alexander got back home, but ended up in SKA and won the Gagarin Cup. But he could not get a lot of ice-time in such a stacked lineup. He had plenty in Spartak, where he got just before the start of the last season. Khokhlachyov became a true leader and offensive force for the team, other than its top scorer and goal scorer. On April 27, Spartak announced that Khokhlachyov will play a further season for the Red-Whites. In the 2016/2017 season, Markus Svensson was the undisputed number one goalie for Spartak. Even though the season wasn’t the best, the Swede’s experience and talent avoided the team to lose even more games. But the 2017/2018 wasn’t as good for Svensson. After the defeat in the first game against Sibir (1:3), when he had 24 saves on 27 shots, the Swedish goalie was benched for five games. Then things slightly improved, but around mid-November, Svensson lost the coaches’ trust. Nikita Bespalov became the team’s starting goalie, and Alexander Trushkov started getting to the bench as his backup. More than once, Alexander Yepanchintsev said that he was perfectly happy with that goalies tandem and at the end of March it became clear that Spartak would not renew his contract with the Swedish goalie. Regular season: Alexander Khokhlachyov – 50 points (19+31), Lukas Radil – 38 (16+22), Ryan Stoa – 30 (15+15), Ben Maxwell – 28 (12+16), Ville Lajunen – 26 (6+20).